We’d love your help. Let us know what’s wrong with this preview of Runes and Red Sails by Ander Levisay. Dive into the thrilling first novel in the new fantasy adventure epic, the Queenmaker series! Welcome to Heimgard! Aelfhild always tried to keep her world small. She served the future queen; she did her duty. She kept quiet. But the world had other plans. When the assassins came for her mistress, there was only one choice: run. Swept into a world of longships and bloodthirsty raiders, of sky-splitting storms and heaving seas, of old gods and treachery, Aelfhild has to find her footing—and fast. She’ll tangle with scheming lords and stand alongside stoic shieldmaidens. She’ll raise a mug with drunken warrior-poets and set sail for unknown lands with a crew of restless misfits. It’s going to take all the strength and courage she can muster. And more than a little luck. Surviving in the world of Heimgard is one thing, but keeping the true heir to the throne alive long enough to see the crown? 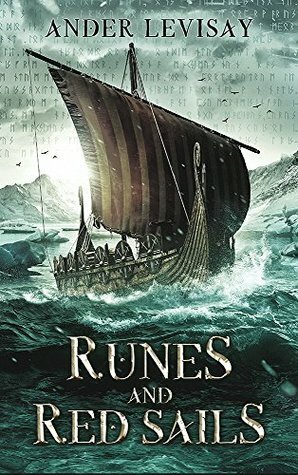 Runes and Red Sails is the first installment of the Queenmaker series, a roaring fantasy adventure set in a world inspired by Norse and Old English mythology. To ask other readers questions about Runes and Red Sails, please sign up. Hi! Does this book includes pirates?? I won this as a first-reads on Goodreads.com and I must admit, I loved it. I had no doubt that I would. I love all things nautical, all things Viking and all things Scandinavian. Did you say this is part one of a series? You can count me along for the ride. Just like a Viking with his mead at the dinner table, give me more, I say! 4 1/2 stars—love a book with clever and strong women as well as some unexpected twists! Can’t wait to read the rest of the series! Diving into a world of royaly kings and warriors it starts off very sad with the death of King Osred of Earnfold. The king didn't deicide on which child would be the next king or Queen of Earnfold. His son Osric was casted out once Ceolwen came to the knoweladge of his birth. After the kings Death with the processional out to the graveyard where the king will lay. Osric approched Aelfhild and tried to get her on his side to be the next King of the land meanwhile Ceolwen has no idea this is going Diving into a world of royaly kings and warriors it starts off very sad with the death of King Osred of Earnfold. The king didn't deicide on which child would be the next king or Queen of Earnfold. His son Osric was casted out once Ceolwen came to the knoweladge of his birth. This book went way above and beyond my expectations. There were no glaring errors in the writing that distracted me from the story. And the story itself was great! There was no awkward, heavy, clunky dialogue or massive info dump or unbelievable characters. Runes and Red Sails very aptly begins the start to what could be an epic fantasy series. It houses a strong cast of characters, vivid settings and an intriguing story. I was leaning on giving it a three out of five, but the ending bumped it up. Now that I know what is possible, I desperately want to see more of the fantastical in the series to follow. I suspect we will. Had we seen more of the draugr, and other fantastical elements earlier, I think I would've finished it much quicker. As it is, m Runes and Red Sails very aptly begins the start to what could be an epic fantasy series. It houses a strong cast of characters, vivid settings and an intriguing story. Now that I know what is possible, I desperately want to see more of the fantastical in the series to follow. I suspect we will. Had we seen more of the draugr, and other fantastical elements earlier, I think I would've finished it much quicker. As it is, my biggest gripe with this tale is how long it took me to read it (considering its short length). But the ending not only made up for the slog in the middle, but also peaked my anticipation for books two and beyond. Great book with a strong female protagonist venturing out into unknown lands and seas. It’s a fascinating fictional world with characters battling against other regions, Mother Nature, as well as their own fears and doubts. I'm glad this is the first in a series as I can't wait for the next one to come out and the tale to continue! This book was hard to put down. I love ancient history and I love how he adapted Norse stories and lifestyle to his own world. Thank you for a delightful read! loved it. just a fun adventure story with a twist ending which left me wanting to read he next installment. female charaters ae at the heart of the story and I found this refreshing too. I won a free copy of this box so thank you Mr. Levisay!! This book was great, a strong heroine that you can like. I'm excited about book 2 and can't wait to continue with this series!! The book started a bit slow, but ended well and used the Norse setting and people believably. We are proud to announce that RUNES AND RED SAILS (Queenmaker Book 1) by Ander Levisay is a B.R.A.G.Medallion Honoree. This tells readers that this book is well worth their time and money!